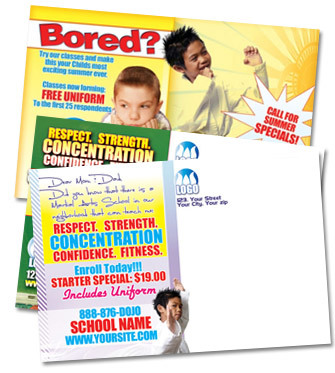 Save time and money by using our direct mailing services. We can design, print & mail your postcards without you having to be bothered with anything other then approving the design artwork! We can use your existing mailing list or create a targeted mailing list based on your demographic specifications and requirements. Receive maximum postage discounts from the U.S. Postal System, and eliminate the costs of having the cards shipped to you. By default our mailing lists are generated with a radius spanning outwards from your martial arts school location. If you would like to target areas in a different manner please enter details in the "Additional Notes" section.